This was a special sale at Aldi this week. The strawberries normally run $2.99-$3.99 per package. I was so excited about this price this week! I can’t figure it out. You would think strawberries would be cheaper in California where you probably have a longer growing season. Here in Michigan we regularly have them on sale for $2.50. In the summer, they are often 3/$5.00. The most expensive I have ever seen them is $3.99. A month ago or so, Kroger’s free Friday download was Jenos pizza. My pizza-loving three year old refused to eat it. It was pretty bad. The crust was strangely flaky and the sauce tasted like condensed tomato soup. You normally could but Ibotta doesn’t work at Aldi. Hopefully someday soon. Maybe I missed it but how many mouths is she feeding? She did get some good deals. Thanks! wow. our milk is $4.10 at aldi. it’s killing us. Wow.. that is expensive. That would be cheaper than the price at our local gas station, but it was 2.19 at Walmart this week. Wow! I thought $3.39 at Aldi was high for milk. And that’s the cheapest I can find it. Our Aldi opened in October and milk was $1.99 for probably two months and then I noticed the price going up since. We go through tons of milk with a teenage boy and two little ones in the house. You can double or triple the prices of most of the items if you live in the North East where I’m from. 🙁 it probably would be cheaper for me to pay you to grocery shop for me and then ship it to my house lol. Thanks so much for posting your shopping trips. I’ve definitely changed the way I shop since I started following MSM. I’ve learned to shop much more creatively & spend much less!! 🙂 Thank you Gretchen, Crystal, & others for your money saving tips!!! I had some homemade crock pot yogurt (MSM’s recipe) in the freezer that I froze in 1/2 cup portions the last time I made it. I recently used it in venison strogonoff instead of sour cream & it worked great! Oh, what a great idea on the yogurt! I also live in the northeast. I get milk at BJ’s for 2.50 a gallon. I wasn’t aware that Aldi’s took any kind of coupons. Do they take the 51 ones? They don’t take coupons but Checkout 51 isn’t a coupon. You purchase a listed item and then submit your receipt (either via SmartPhone or PC). You get credited whatever the amount is for that item. Once you’ve accrued $20 in cash-back, they will mail you a check. Let me preface this: I really don’t enjoy shopping at Wal-….. but when things are tight, I use price-match to bring our grocery bill down or when I’m stocking up on our emergency prep-supply. 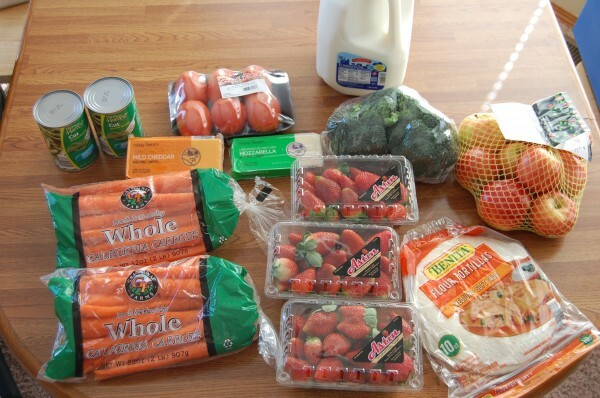 I spent $85 on my last trip for groceries and was able to save $45 using price-match. Is that 40% or something? Take all the best “door buster” deals from other local grocery stores and get a load of good deals. (fyi: they don’t have a good organic section, however) I just clip the current ads/coupons glue them on some paper and voila, I have my own customized ad for a one-stop shop. I give fair warning to the person behind me in checkout that I’m doing mostly price-match and that it may take longer (big smile). I’ve had checkers say, “I should do this too”. Well, yeah, when you can get 6 cucumbers for a $1 or bell peppers for $0.39 cents a lb., 5 lbs of potatoes for $0.88 cents, CPK pizza for $4. (Read the fine print before you try it though – it has to match the brand and quantity, etc.) Just a tip. At the Farmers market in Ontario Canada you can get 5 pints of strawberries for $5 in the summer, and 3 for that price in the winter. Awesome produce there and if you go at 3pm when they are closing they want to get rid of everything. I once got a big box of broccoli for $1. I also have the question of how many people she is feeding in this budget? Also, when I consider my weekly spending on groceries, I consider that three meals a day, for at least 6 days (as Friday nights we go out and normally eat lunch out once a week) for 5 people. That includes my husband packing his lunch 5 days a week for work. Does this budget include all meals for the whole family? My other issue is the age of the children, I have a very hungry husband and preteen son. Keeping them fed and full is a huge chunk of my weekly budget! LOL I have noticed as my children get older my grocery bill becomes higher! Just some questions I have. Thank you! Thanks so much for doing this! I love, love, love reading these. 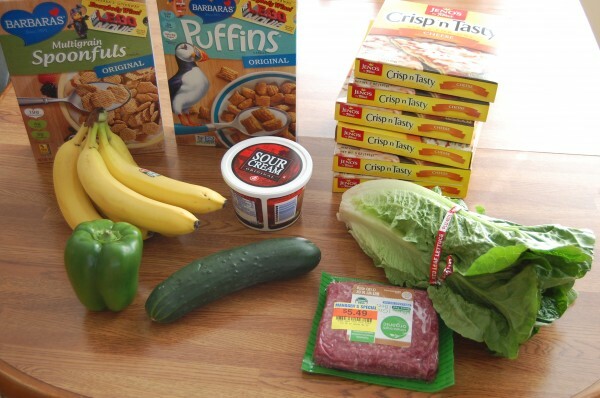 It helps so much to see exactly what you buy and how you use those ingredients to make your meal plan. I never see snacks listed. Does your family only eat 3 meals per day?